She is an amazing woman who made an incredibly long comment on my post Making It On One Income. (You might want to go read it along with all the other wonderful comments!) She does everything she can to live within her husband's income even if it means sacrificing some of the pleasures in life. Most women today simply put things on their credit card, thus digging their family deeper and deeper into debt. This is NOT a good way to live. Stuff will never bring happiness and debt makes us a slave. Why not learn from this very thrifty woman! Here, in her words, is how she does it. We breastfeed, use cloth diapers, napkins, 'mama cloth', line dry, solar cook, burn wood for heat that we harvest ourselves. We cook on the wood stove, buy all clothes that we NEED second hand (except socks and underwear). We pick as many wild blackberries as we can during the summer and freeze them. I make my own cleaning products, personal care products, and most condiments. I would also add that we have a child with multiple severe food allergies, and I do buy our staple foods in organic versions and make all my own baked goods, treats, etc. from healthier ingredients. We have SLOW Internet, no cable. No smart phones. No fancy gadgets. We do have newer vehicles, one that we are still paying on, and my hubby just bought a motorcycle for its fuel efficiency for his commute. We have a small backyard flock of chickens for egg and for meat. We use natural lighting and open the windows when it gets hot; we don't turn the A/C on until it gets to 85 degrees. We unplug all of our electronics when not in use, except for the fridge, upright freezer, alarm clock and the electricity that runs our well pump. My kids don't do organized sports. If they get a gift that they really don't like, we store it to re-gift to a friend. We don't do big birthday parties; just milestone birthdays. We limit their Christmas gifts to 5 things; a want, a need, a wear, a book and a new Christmas ornament. Vacations consist of visiting family in another state. We limit driving. We limit eating out, or impulse shopping; we stick to the grocery list. If the kids don't leave the house or play outside, they don't take baths. When they do bathe, they share bathwater. I clean the shower with baking soda when I take my shower. We ask for new shoes from grandparents at birthdays and Christmas. I work at our local YMCA to get a free family membership. We got rid of all of our carpeting so I could just sweep the floor and not have to use electricity to vacuum. We hardly ever, ever go to the movies, if we do its the second run theater. We don't have expensive hobbies, or participate in expensive activities. I sell things we no longer need on EBay. I could go on and on. 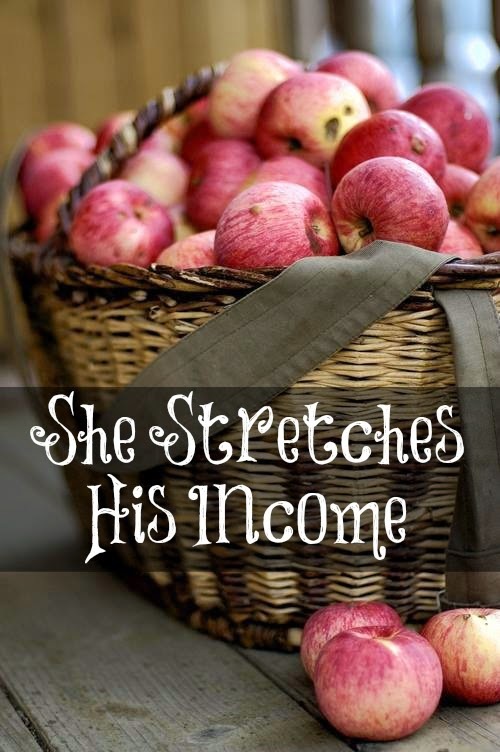 I'm always looking for ways not necessarily to SAVE money, but to stretch my husband's hard earned income more. Is an Egalitarian Marriage the Truth? Feminist's Lie ~ "It's All About You!" What Do You Wish Your Parents Did Differently? Learning from Two Joyful Women! Giving Up Babies for Hobbies? Is Her Role Any Less Noble? Are These Wives Really Single Mothers? Should Ken Meet My Deepest Needs? Does Your Healing Depend Upon Your Faith? Keepers at Home ~ Description or Prescription? Did Women in the Bible Work Outside of the Home?